Their collaboration agreement will afford startups, SMEs and research groups the opportunity to reach the stratosphere, a unique test environment necessary for some innovative solutions. The goal is to enable these entities, and not only large companies, to be the beneficiaries of the unique conditions that only space can offer for designing, testing and certifying new solutions and products, conducting scientific activities or even developing new business models. 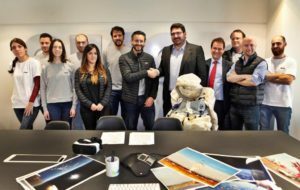 Madrid, 24 January 2018 – The leading consulting and technology company Indra has signed a collaboration agreement with Zero 2 Infinity, a startup specializing in Space transportation systems, with a view to rendering more simple and accessible trips into Space, a sector of enormous potential that continues opening up to private initiatives. 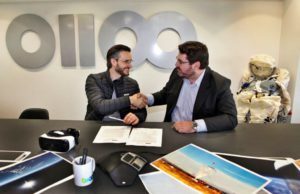 Manuel Ausaverri, Indra Innovation and Strategy Director, and José Mariano López Urdiales, Zero 2 Infinity CEO and founder, signed the agreement at Zero 2 Infinity’s Barcelona headquarters. A leader in developing and implementing technologies for satellite control centers and with extensive experience in Earth observation and satellite communications solutions, Indra is applying its capabilities and know-how to Zero 2 Infinity’s developments in this field to revolutionize access to the stratosphere. This partnership will prove that Space is not just for large institutions and companies by bringing Space access within the reach of SMEs, startups and research groups. The overall purpose is to be able to benefit from the unique conditions that Space offers when making tests for certifying and developing technology solutions and products that require such an environment for experimentation, conducting scientific activities or even developing new business models: testing autonomous communication systems, conducting tests that require low temperatures or pressure levels, securing weather or meteorological data or even securing a vantage point for viewing a specific area of the Earth. Moreover, the agreement will enable the creation of new initiatives and further the commitment that both Indra and Zero 2 Infinity have to innovation in this sector, for which they will jointly examine potential missions. The alliance will also serve a didactic purpose, since all the jointly conducted activities will be broadcasted to bring the Space sector into the realms of industry and research. Signing this agreement is a gradation of the different steps that Indra is taking through Indraventures to reinforce the relationship with the entrepreneurial ecosystem to further its commitment to innovation and working more closely with startups, spinoffs, entrepreneurs and intrapreneurs. The ultimate purpose of this open, agile and flexible innovation model is to strengthen Indra’s leadership in technology and to identify, generate and incorporate solutions that are innovative, disruptive and with an elevated commercial potential. Moreover, Indraventures is the driving force for financing initiatives of this sort, providing them with not only Indra technology, human capital and infrastructure in accordance with their needs but also access to markets or a possibility for internationalization. Zero 2 Infinity in turn now has a new ally to continue its progress in Space, since the number of companies providing services related to this field is growing: Earth observation, communications, big data, security, weather forecasting and machine interconnection through the Internet of Things, just to name a few. They all require a secure and efficient Space transport service, such as what this startup provides with Bloostar, its small satellite launch vehicle. 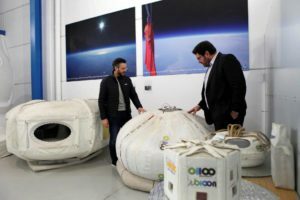 The company also has medium-term projects such as Bloon, which aims to send scientists and even tourists to Near Space. As Spain’s number one company in implementing land-based satellite management segments, some of Indra’s activities include leading the deployment of the Spanish Paz and Ingenio Earth observation satellites. Indra is also a part of the major multinational consortia working on the most technologically advanced programs such as the Galileo global positioning system, European Space Surveillance and Tracking (SST) system and Copernicus Earth Observation program. Indra’s innovation model is contributing to the company’s transformation process by improving the portfolio and generating a new, more innovative culture throughout the organization. In permanent contact with external agents of the entrepreneurial ecosystem and its own professionals, Indraventures is the vehicle for channeling initiatives, collaboration agreements, incubation and/or acceleration activities. The focal point of the Indraventures investment strategy encompasses emerging ideas and initiatives in the development phase that require acceleration, addressing the specific needs of each one. Since Indraventures was launched in 2017, Indra has entered into agreements with the technology startup AutoDrive Solutions (ADS) and entities including Enisa and Socios Inversores; jointly launched a call with the Regional Government of Gran Canaria for supporting innovative ideas to meet the challenges of creating an intelligent island; worked closely with research workgroups and spinoffs from numerous universities; and fostered and recognized the entrepreneurial spirit of its professionals through Innovators, the company’s intrapreneurship initiative. 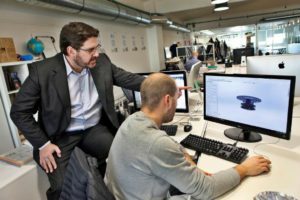 A Barcelona-based privately owned company with operating bases in the Canary Islands, Andalusia, and Catalonia, Zero 2 Infinity is radically simplifying Space access services. Specialized as a single non-state actor in Europe in the Near Space transportation of components requiring testing and certification in Space conditions. The company is working on placing small satellites into orbit with the Bloostar project and medium-term plans to send people to Near Space for scientific activities and even tourism (Bloon project). Indra is one of the world’s top consulting and technology companies and a technology partner for the key operations of its customers’ businesses worldwide. It is a leading worldwide provider of proprietary solutions in niche areas in transport and defense markets and the absolute leader in IT in Spain and Latin America. It offers a comprehensive range of proprietary solutions and cutting edge services with a high added value in technology based on a unique culture of reliability, flexibility and adaptability to the needs of its customers. Indra is a world leader in the development of end-to-end technology solutions in fields such as defense and security, transport and traffic, energy and industry, telecommunications and media, financial services, electoral processes, and public administrations and healthcare. Through its Minsait unit, it addresses the challenges of digital transformation. In 2016 Indra posted a revenue of €2,709m, employed 34,000 professionals, and had a local presence in 46 countries plus sales operations in more than 140 countries. Following its acquisition of Tecnocom, Indra’s combined revenue amounted to more than €3,200m in 2016 with a team of nearly 40,000 professionals.